This system is a true Low Air Loss integrated bed system (E0193). It provides pressure relief combined with the reduction of moisture, shear, and friction. This system promotes comfort, therapy, and safe patient handling, while healing the patient’s wounds. 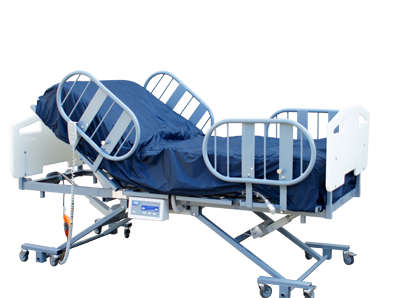 This bed system is covered under Medicare Part B as an (E0193). It is reimbursed in New Jersey by Medicaid in skilled nursing facilities and in Pennsylvania as “Exceptional” DME, as well as many other insurance companies.. The patient surface incorporates true Low Air Loss with the newest technologies to provide advanced pressure relief for treatment of Stage I – IV pressure wounds. The patient’s body weight is redistributed over a greater area than a standard mattress, allowing maximum pressure redistribution and constant pressure relief within the three 8” deep pressure zones. The true Low Air Loss surface creates the ideal microclimate for wound healing. With up to 1500 liters per minute of air flow, the vented patient surface and vapor permeable cover reduces heat and moisture to the patient’s skin surface. Multiple control unit functions allow the caregiver to customize the surface to the patient as well as facilitate patient care. protection for the patient at risk for fall and delivers convenience to the caregiver. The fully electric bed frame allows full articulation of the bed surface including Trendelenberg, reverse Trendelenberg, head up, knee up, and locked wheels. Full electric articulation including Trendelenberg and reverse Trendelenberg. Functions on side of the bed. Control Unit: Microprocessor controlled blower, 1500 LPM output.